One More Sekimori Ishi, Abstracted. I’m still playing around with the sekimori ishi idea. This version was accepted and shown at the Celebration of the Arts at the First United Methodist Church in Grand Rapids, Michigan, February 10-22, 2017. The juror was Marion DeVinney. A sekimori ishi is used in a Japanese garden to tell visitors to not use a particular path. It also has a metaphorical meaning of “stay on the right path (in life)”. 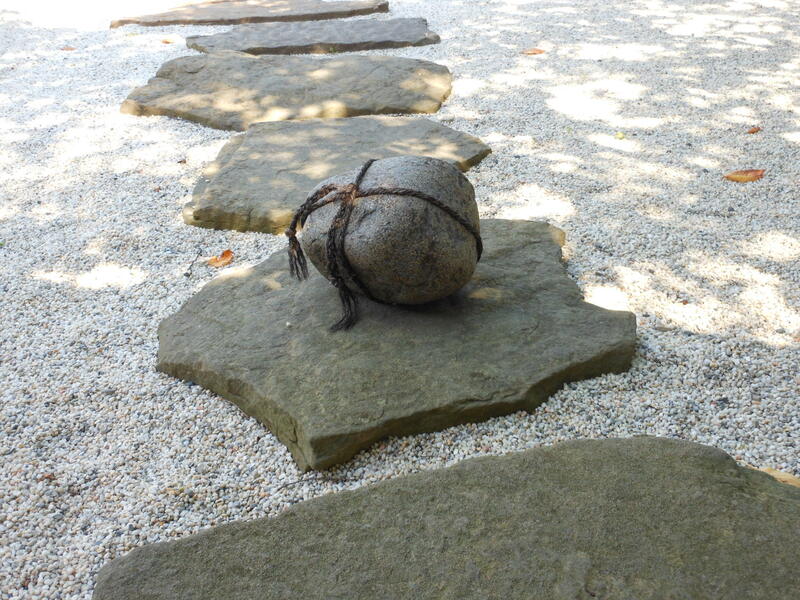 The original sekimori ishi is a stone tied with garden twine, which I have abstracted to a stone shaped lump and a handle. The “stone” in this piece is actually wood, a burl from a honeylocust tree that I had been saving for more than 20 years. It was minimally carved, then charred on the outside, using a slight modification of my aluminum melting furnace. It was then scrubbed and allowed to dry, then given a light coating of boiled linseed oil. This is a Japanese wood preservation technique, also used by some Mono Ha artists and by David Nash. My original idea for the handle was to use an old rusty U bolt, but I had difficulty finding what I wanted. Some artists suggested making my own. When I could not find one half inch diameter steel rod, I resorted to using rebar. When searching for ways to bend this using minimal tools, I found a site that described rebar as “the bologna of metals”, as it is often made from miscellaneous remelted magnetic scrap. I cut it with a hacksaw, and bent it using and iron pipe and a 2X4 from a shipping pallet. I then drilled the holes in the wood, and used 2 ton epoxy to hold it in place. After the show, I was pleased to see that Ai Wei Wei had produced porcelain rebar replicas for one of his pieces. Like Mono Ha art, my sculpture contrasts an industrial material with a natural one. This should suggest concepts like Yin and Yang. The wood treatment is a traditional Japanese technique, and is a nod to the Mono Ha artists. This sculpture is meant to induce the viewer to think about rules and guidelines. One interpretation is that the stone represents the reason for the rule. It exists even without the sekimori ishi, and probably should not be ignored. The handle is man made, and is the rule itself. It can be bent and twisted, and even used to remove the stone entirely. This entry was posted in My sculpture, Sculpture. Bookmark the permalink.